Through his brother, who had been imprisoned in Camp Amersfoort, Juda had already become aware of the meaning of living, or rather suffering, in a concentration camp. From 1941, Camp Amersfoort served as Durchgangslager & Erweitertes Polizeigefängnis (shortened to: Polizeiliches Durchgangslager Amersfoort - PDA). It was a transit camp for sending people to Germany, but it also fulfilled the criteria for a slave labor camp or prison camp. On 18 August 1941 the first prisoners arrived from camp Schoorl, a group of almost 200 Communists. For that matter political opponents of the Nazi regime were not the only ones who wound up in PDA. 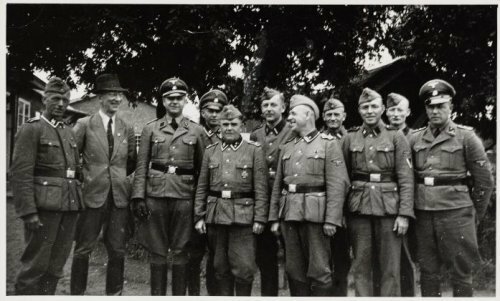 The largest group consisted of people in hiding who were apprehended, mostly young men and adult men who had wanted to escape the Arbeitzeinsatz [forced labor] and now were being “prepared” for employment in Germany. In addition, people who had committed economic offenses – black marketers and illicit butchers – ended up in the camp. Amersfoort was a notorious camp. Camp bullies like the SS commander Kotälla ran the place, and nothing limited their cruelty. In addition there was the usual system of kapos, prisoners who were in charge of other prisoners but often acted cruelly. 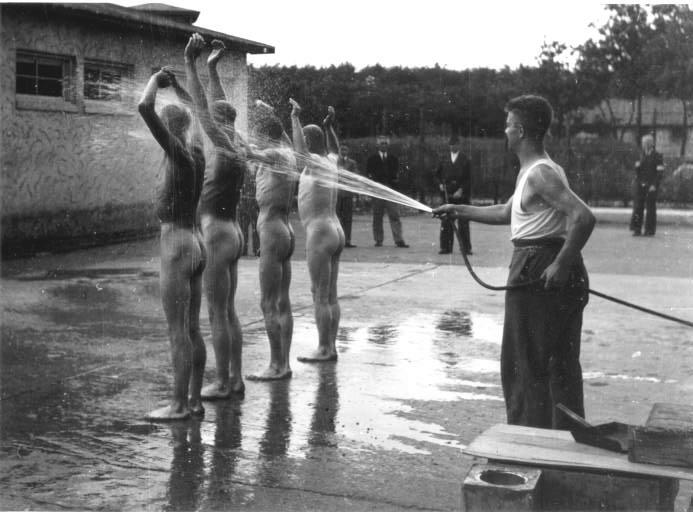 Naked prisoners at camp Amersfoort being sprayed clean. © Collectie Algemeen Rijksarchief Den Haag, ANEFO nr.900/4794.